I am brand new to Xamarin and I am trying to jump right in. There is a post that I am trying to replicate (https://blog.xamarin.com/put-adal-xamarin-forms/) and am having issues adding the NuGet package to both my Xamarin.Forms and Xamarin.Android applications. I am running PCL 4.5 - Profile 78 in my Xamarin.Forms project and the Droid project is targeting the latest installed platform (6.0) with an target android version of API Level 23. When I attempt to add a reference to the "Active Directory Authentication Library" v 2.19.208020213, to either project, I am receiving an error to the effect of "Could not install package 'Microsoft.IdentityModel.Clients.ActiveDirectory 2.19.208020213'. You are trying to install this package into a project that targets 'portable-net45+win+wp80+MonoAndroid10+xamarinios10+MonoTouch10', but the package does not contain any assembly references or content files that are compatible with that framework. For more information, contact the package author." Can anyone help me understand what I am doing wrong? The referenced tutorial makes it look so easy and I am stuck simply adding a reference. The Microsoft.IdentityModel.Clients.ActiveDirectory 2.19.208020213 NuGet package does not support Portable Class Libraries. In the blog post they are using Microsoft.IdentityModel.Clients.ActiveDirectory 3.5.207081303-alpha which is a pre-release, and does support Portable Class Libraries. To use the pre-release you can check the Show pre-release packages at the bottom of the Add Packages dialog. Thanks Matt! 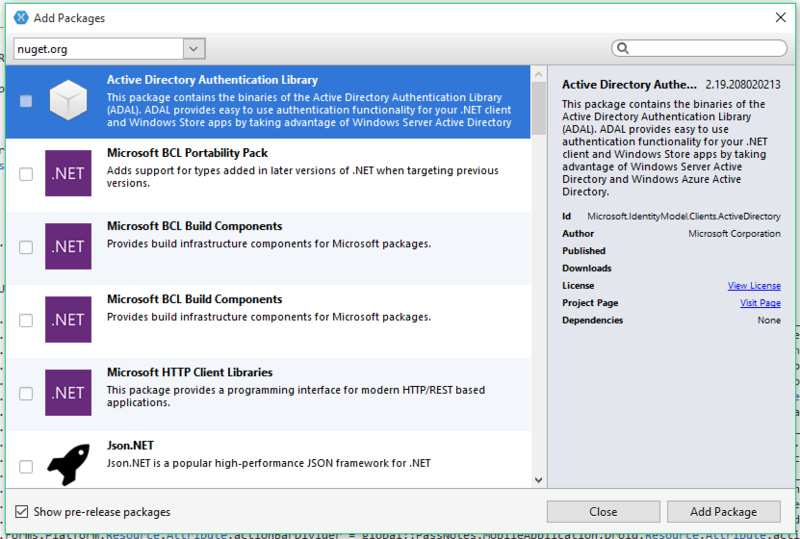 I was successfully able to get that package installed by using the following NuGet command in the console window. " install-package Microsoft.IdentityModel.Clients.ActiveDirectory -version 3.5.207081303-alpha"
Any idea will/when Microsoft will release a new version that support Xamarin.Forms PCL project? I was able to add the latest stable release to my solution by jumping through the following hoops. @MStandiford Thanks a lot! You saved my lunch hour. Unfortunately, the Microsoft AD authentication team have done a bang up job of screwing up authentication support for mobile applications. It appears to be a recuring theme at Microsoft that authentication libaries are developed by teams with a web bias, and mobile is an afterthought (MSAL anyone? - what a joke, that team doesn't even seem to be able to read standards). This has resulted in this ADAL library being released without support for Windows Phone 8.1. Pathetic and unprofessional implementation from Microsoft yet again. MSAL is even worse - unreliable authentication on the iOS implementaiton, reliance on embedded Web Views, bugs all over the code in the Git repository, and almost non existant documentation. So, as @MStandiford says, you have to change the supported targets for your Xamarin.Forms PCL to remove any reference to Windows Phone and Silverlight.